Pioneer's latest multimedia receiver is the most feature-packed to date and will help to make car journeys less boring and more enjoyable for everyone on board. In-car entertainment has come a long way. Many systems today can play music and even video from a staggering array of sources: radio, CD, portable music players like the iPod, USB, SD cards, Bluetooth audio and more. Smartphone compatibility is the next 'must have' for all in-car entertainment systems in this time, which is why Pioneer’s latest flagship multimedia receiver was designed around the smartphone, offering a range of features and compatibility for the ever growing list of phones. 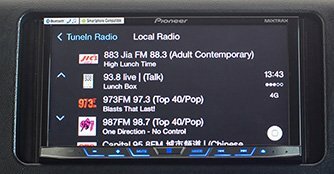 Pioneer is one of the first aftermarket car entertainment providers to support Apple CarPlay in Singapore. This innovative function is currently available for selected Pioneer models such as the newly launched flagship multimedia receiver - the AVH-X8750BT. Especially with the recent local regulations on using a mobile device while driving, Apple CarPlay offers a smarter, safer and more fun way to use an iPhone in the car. Consumers with the latest version of iOS on their iPhone 5 or later can use Siri voice control to make and receive calls, compose and respond to text messages, access Apple Maps for navigation, as well as listen to music, podcasts, Spotify or iTunes Radio. Singaporean consumers will also find it easier to communicate with Siri as the 'personal assistant' is now able to support 'Singlish' so sentences constructed with bits of 'Singapore English' will be better interpreted. On the other hand, non-iPhone users will be pleased to know that the new multimedia receiver can also support Android Auto, although the system is not available in Singapore just yet. There is no cause for worry though, as users can still rely on Pioneer's dynamic AppRadioMode and AppRadioLIVE for connectivity with their smartphones.